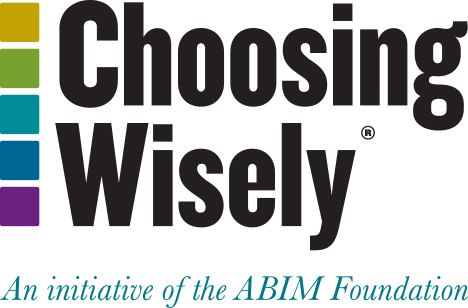 With a focus on stimulating physician and patient conversations, there is perhaps no more appropriate environment in which the Choosing Wisely® campaign could take hold than the examining room. Cedars-Sinai Health System has taken an important step in ensuring these conversations happen by becoming the first system in the nation to incorporate dozens of specialty society campaign recommendations into its electronic medical records (EMR) system. benzodiazepine as a first-line treatment for sleep in the elderly. Cedars has since expanded this effort throughout its health system, including Cedars-Sinai Medical Group and Cedars-Sinai Medical Center. Cedars programmed its EMR to alert physicians who attempt to order a test or treatment that is referenced on the Choosing Wisely lists to provide more information before physicians can proceed. For example, if a physician attempts to order an electrocardiogram or other preoperative test before a minor surgery, an alert will warn that such tests do not lower operative risks. A physician ordering an antibiotic for a patient suffering from bronchitis will be reminded that antibiotics are ineffective for healing viral illnesses. Each alert contains links to citations provided by the specialty society that issued the recommendation. Through the EMR, physicians can also access consumer-friendly materials produced by Consumer Reports that explain why a particular test or procedure may not be appropriate. Understanding that each patient presents a unique case, physicians can override the alerts if they still believe their proposed intervention is appropriate; the system will allow the order to be entered once the physician includes a reason for disregarding the recommendation. Although the proliferation of alerts that have been inserted into electronic medical records has led some researchers to highlight “alert fatigue” in which physicians disregard alerts due to their frequency, Scott Weingarten, MD, Senior Vice President and Chief Clinical Transformation Officer at Cedars-Sinai, said that it had not been a problem at this point in the implementation because of the specialty society involvement. He said that Cedars is tracking the frequency with which alerts are “fired” and how often they are heeded, and analyzing information to provide a more detailed picture to Cedars-Sinai physicians. False-positive rates for the alerts have been low, according to Weingarten. Dr. Weingarten said that Cedars-Sinai made the decision to lead in this area both because it was the right thing to do to ensure that patients received the right care, and because it helped the system’s physicians respond to patient requests for services that will not benefit them.